Brayton Walters was born December 2, 1991, in Rancho Cordova, CA. He departed this life the morning of July 31, 2015, near Truckee, CA. Brayton was a stellar student with two degrees and a hard-working young man. He graduated from Cordova High School in 2010 and was attending American River College while working for Tony’s Fine Foods with his brother Taylor and his father Tom. Brayton was scheduled to join the Coast Guard, as he wanted to serve others, as he has done many of times in the community. Brayton enjoyed playing Football, but found his true passion in playing Rugby and the friends and family it brought him. He loved nothing more than building up his Toyota and to be in the outdoors wheel’n in the snow, rock crawling, fishing, camping and enjoying his time spent with his family and friends laughing, joking and hanging around the campfire. Brayton loved his family and was considered a leader within the family by his brothers. Some might say he was a Mama’s Boy but he was his Dad’s Proud Young Man as well. Brayton is preceded in death by his mother, Mindy Walters who passed less than a year ago on August 24, 2014. Brayton is survived by his father Tom Walters, his brothers Taylor and Austin Walters, his grandparents Herb & Ruth Walters (Eagle Lake, CA), Rita Granada (Pacific Palisades, CA) and Leroy Martinez (Anguilla, BWI), girlfriend Zuray (Suedy) Perez (Rancho Cordova, CA), and aunt Melissa (Michael) Riner of (Castaic, CA), Karen (Barry) Cohen of (Pacific Palisades, CA); Nephews Ian (Danica) Riner of (Valencia CA), Aaron Riner (Castaic CA), Max Cohen; nieces Elise Riner of (Santa Clarita, CA) and Arielle Cohen. 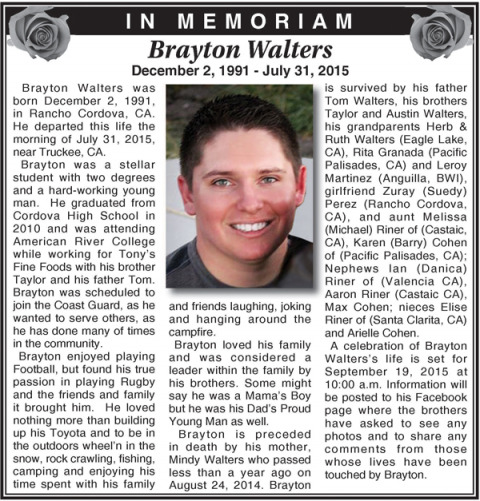 A celebration of Brayton Walters’s life is set for September 19, 2015 at 10:00 a.m. Information will be posted to his Facebook page where the brothers have asked to see any photos and to share any comments from those whose lives have been touched by Brayton.